Since the snow melted, I’ve been looking for the perfect spring patterns to decorate my living room and screened-in porch with. I haven’t had much luck, though. 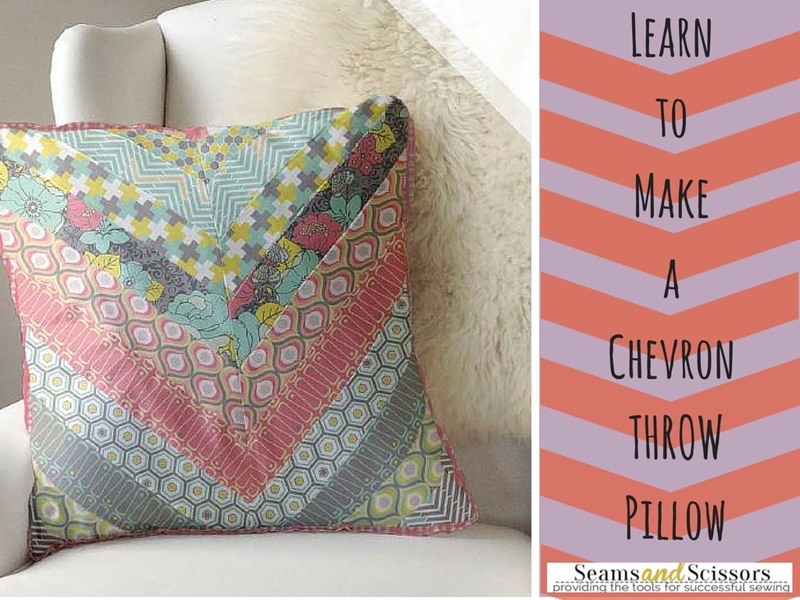 That’s why I was so excited when Camelot Fabrics offered to share this free chevron pattern for a DIY pillow with us. Don’t worry if you don’t know how to make a pillow. This tutorial is chock FULL of visuals and filled with helpful tips that will keep you on track. Arrange a set of these pillows on your couch while serving lemonade or mimosas to your visiting friends. They’ll be wondering where on earth you bought such lovely, expensive-looking throw pillows. As you lift your glass to your lips, you can tell them with pride that you made them yourself! 1. Cut (5) 1-1/5” x 22” strips from 2140708 #2 for the Edging. 2. Cut (1) 16“ x 20” rectangle from 2140707 #2 and (1) 16“ x 20”rectangle from 2140709 #3 for the Back. 3.Cut (2) 2-1/2” x 22” strips from each of (12) Fat Quarters, to be used as the Front pieces. 4. 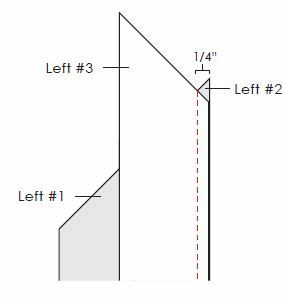 Trim one short end of each Front piece at a 45º angle as shown. Make sure that the two strips of each pair are cut with their slants running in opposite directions. 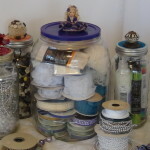 Divide your Front pieces into two piles: one for the Left pieces and one for the Right. 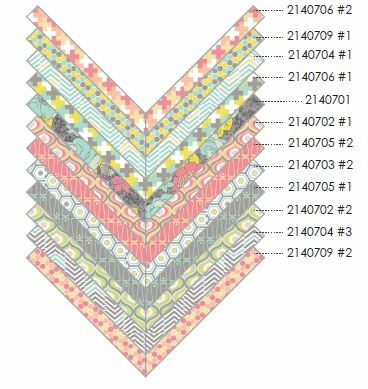 If you’d like to reproduce our pillow exactly, please refer to the layout below for the order of the strips. 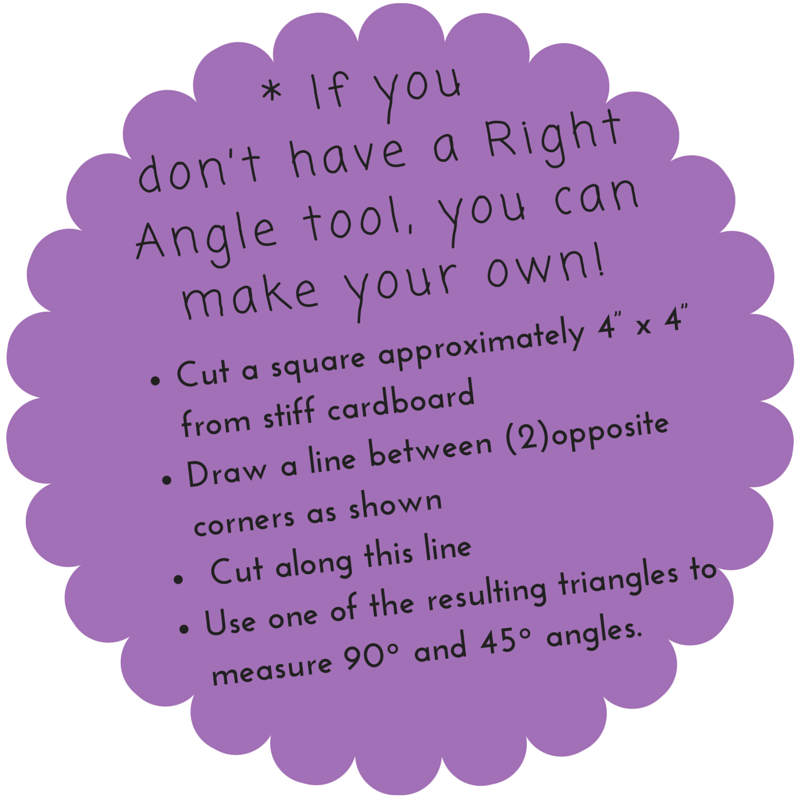 *If not, take a few moments to lay out all the strips of one side (or both) on a large flat surface, to determine which sequence of patterns looks best to your eye. 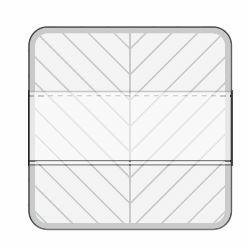 Keep in mind that the strips toward the top and bottom of the pillow will only show in small parts, while the strips toward the center will show almost fully. Place Left pieces #1 & #2 as shown, Right Sides together. Their slanted edges should cross 1/4” away from the right-hand sides. Sew the two pieces together with a 1/4” seam along the long right-hand edge. Sew Left piece #3 to the second long edge of Left piece #2 as shown, in the same manner as you sewed the first two Left Front pieces together. Continue sewing each successive piece to its precedent in the same way until all twelve Left Front pieces are sewn together. Press all Left Front seam allowances toward the top of the pillow (Left #1). Place Right pieces #12 & #11 as shown, Right Sides together. Their slanted edges should cross 1/4” away from the right-hand sides. Sew the two pieces together with a 1/4” seam along the long right-hand edge. Sew Right piece #10 to the second long edge of Right piece #11 as shown, in the same manner as you sewed the first two Right Front pieces together. 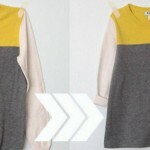 Continue sewing each successive piece to its precedent, in the reverse order from the Left side. 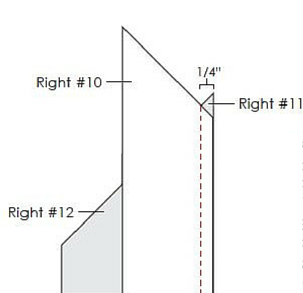 Press all Right Front seam allowances toward the bottom of the pillow (Right #12). 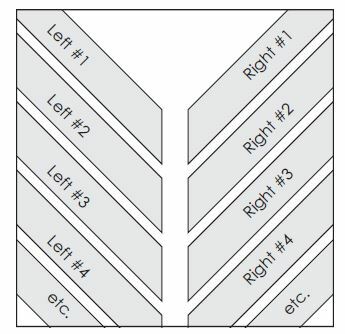 Place the two halves of the Front Right Sides together, with the center edges lined up. To allign your diagonal seams perfectly, pinch each one in turn between your thumb & forefinger, and rub the two sides of the Front together gently until you feel the seams “lock” into place; secure with a pin. Sew the two Front halves together with a 1/2” seam and press the seam open. 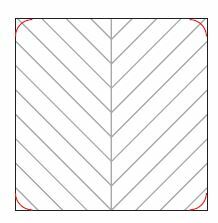 the top & bottom edges of the square are perpendicular to the central seam. Cut out the Square. 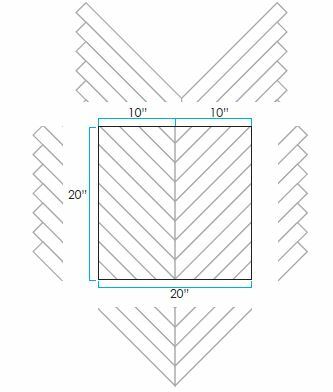 Use a large mug or small bowl to trace a curve into each corner of the square as shown; trim your corners along these curves. Fold the Edging in half along its length, Wrong Sides together, and press. 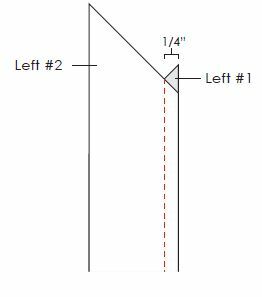 Fold & press a 1/2” hem on one short end. Beginning your stitches 3” from the folded end, baste the Edging to the outer edge of the pillow Front’s Right Side with a 1/4” seam as shown. 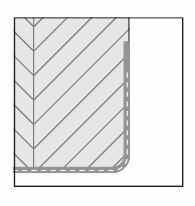 The Edging’s folded edge should be toward the center of the pillow Front, its raw edges against the raw edge of the Front. Take care not to allow it to bunch at the corners. 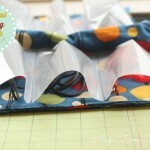 Sew until you approach the beginning of your Edging seam; allowing for 2” of overlap, snip off the excess Edging strip. Tuck the tail of the Edging into the fold of the hemmed end and finish basting the Edging to the pillow Front. Press & sew a 1/4” rolled hem on the top 20” edge of one Back piece and the bottom 20” edge of the other Back piece. These will be your Lower & Upper Back pieces, respectively. Trace & cut rounded corners on the raw corners of both Back pieces to match the ones on your Front piece. Lay the Lower Back on top of the Front, Right Sides together, with the bottom & sides aligned and the hemmed edge toward the top of the work. Place the Upper Back on top of the Front & Lower Back, Right Side inward, with the top & sides aligned; this piece will overlap the upper part of the Lower Back. Pin all layers in place around the pillow’s outer edge. 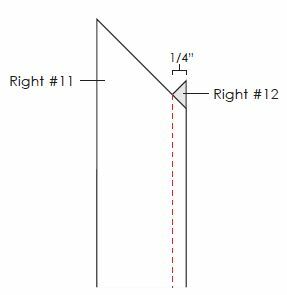 Sew the Back pieces to the Front & Edging with a 1/2” seam allowance along the sides and a 1/4” seam allowance at the corners, to prevent the Edging from bunching. Turn the pillow Right Side out through the gap between the Back pieces and fit it over your pillow form. VOILA! 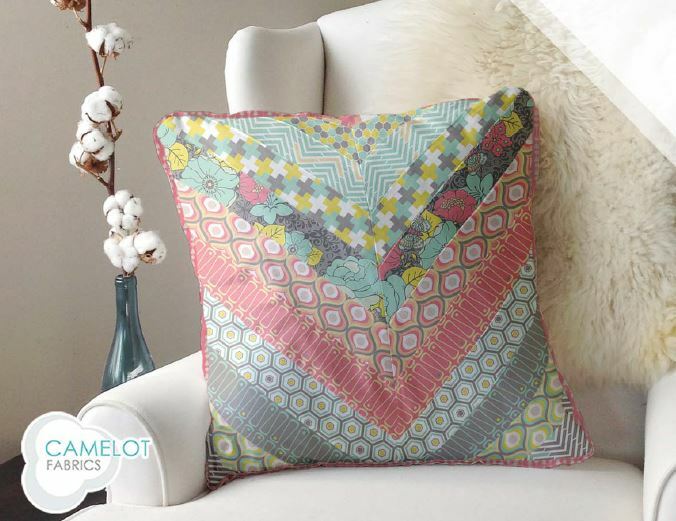 You’ve got a lovely new DIY throw pillow, just perfect for spring and summer! 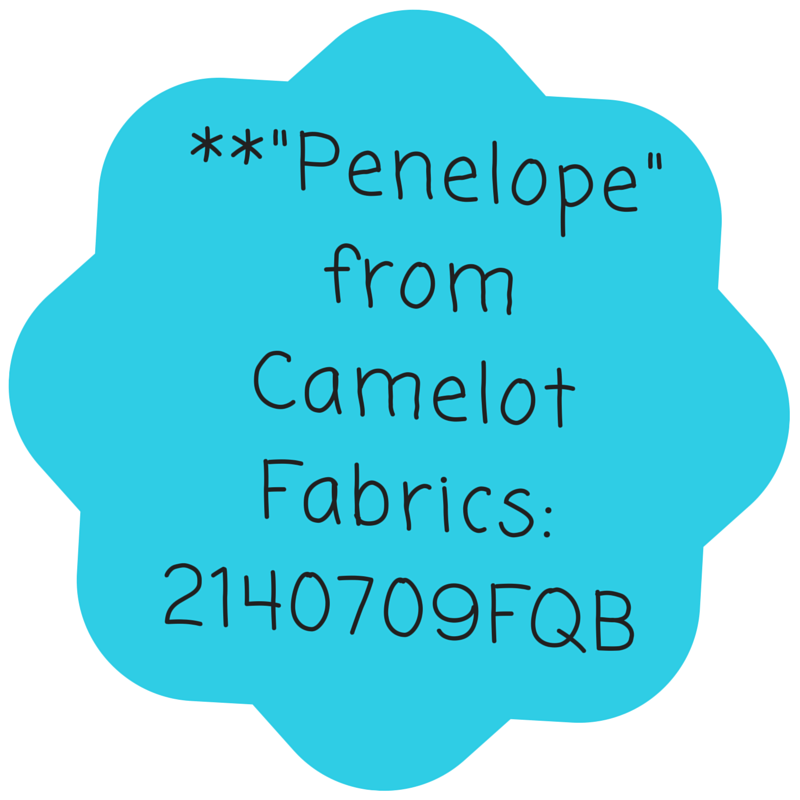 Are you going to use the fabric suggested above or design your own DIY pillow? Great tutorial. Fun way to put color in your room. I’m a novice but I’ll try this cute pillow. Thanks!